In this gripping thriller, the bizarre murder of a Satanic priest in San Francisco draws Dominic Grey and Viktor Radek, private investigators of cults, to the scene. Witnesses claim a robed figure, seemingly able to appear and disappear at will, set fire to the priest. When the leader of another Satanic cult in Paris dies under similar circumstances, the case only grows stranger… and more dangerous. Convinced that a charismatic New Age prophet is behind the murders, the investigators undergo a perilous journey into the world of the occult as they try to penetrate the prophet’s inner circle. From the catacombs of Paris to London’s nefarious East End, from the haunted walls of York to a monastic fortress in the Sicilian wilderness, the case plunges Viktor and Grey into a vortex of black magic, ancient heresies, and the dark corners of their own pasts. The Diabolist is a chilling novel that not only pulsates with action and suspense, but also mines a trove of fascinating historical, philosophical, and paranormal research to probe some of our closest held beliefs. From the opening pages to the astonishing conclusion, this latest installment in one of today’s most original new thriller series is not to be missed. It’s always odd when you come late to a series of novels. In the back of my mind, as I was reading The Diabolist was a vague curiosity about the first Dominic Grey installment, and some questions about the development of the character. Those thoughts were very far back, however, as Layton Green plunges you into his story from the very first paragraph. The journey, from there, is an amazing collection of dark ritual, detailed detection, and delicious description. From San Francisco to Paris, and more, I felt like I was traveling with Dominic and Viktor, and while, at times, I wanted the warmth and safety of four solid walls and bad television, I was, nevertheless gripped by Green’s story. My perception of The Diabolist may be colored, somewhat, by my love of horror and dark supernatural stories (this was the latter, not the former), and the fact that I read this in October. I kept imagining this book as a movie because both the story and the settings felt so cinematic. The confines of a page are not enough for Layton Green’s writing. His work beg to be translated into 100-foot high IMAX images, rendered in 3D, and given a score by Hanz Zimmer (John Williams is too sedate) or something akin to what Philip Glass wrote as the alternate score to Dracula. I’m babbling, but the practical upshot of all this is that The Diabolist is a well written story. The supernatural element serves the mystery but stands on its own. The puzzles never get in the way of plot. The characters all crackle. Layton Green has a new fan. Goes well with: Chicken chili and homemade cornbread, with apple cider on the side. 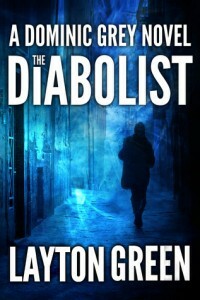 Review: The Diabolist by Layton Green (with Giveaway Raffle) by Melissa Bartell is licensed under a Creative Commons Attribution-NonCommercial-ShareAlike 4.0 International License.